Lowdown: Animal Farm in a high rise building. High-Rise certainly took us by surprise. Being a movie starring the cleaner looking than ever Tom Hiddleston, we’ve sort of expected some polished drama; instead, we got ourselves a weird, eccentric and dystopian allegory. It’s very NSFW, and in case you didn’t get it by now, very weird. It’s the seventies. Our Tom, or rather our Dr Robert, is a very respectable brain scholar moving in to a new apartment at a middle upper floor of a newish giant residential high rise. The building is its own community, and Robert gets to know the attractive single mother above him and the people at the lower floors as well as those at the penthouse. And yes, the residents’ social class dictates what floor they’re on, and yes, class wars ensue. Those class wars go way beyond their logical conclusion. For some reason, however, they do not go outside the realm of our high rise’s parking lot, making it obvious depicted events are not to be taken at face value. 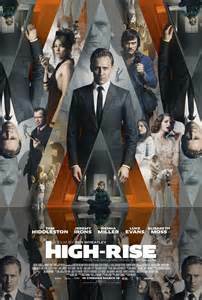 If you are into that kind of thing, you will like High-Rise; if you aren’t, you will probably suffer. Overall: High-Rise is a well played smart film, no doubt about it. Only problem is I haven’t enjoyed watching it, not in the least. At 3 out of 5 crabs, I recommend one only approaches it if one is aware of what’s coming and one is well prepared to deal with the frontal assault that is High-Rise.